What could be better than a beef prosciutto combination? In this recipe, the addition of crispy prosciutto to the beef before grilling intensifies flavor making it the ultimate burger experience. Topping it with fresh mozzarella, plum tomatoes, creamy basil mayo and yes – even more prosciutto will make you savor every bite. 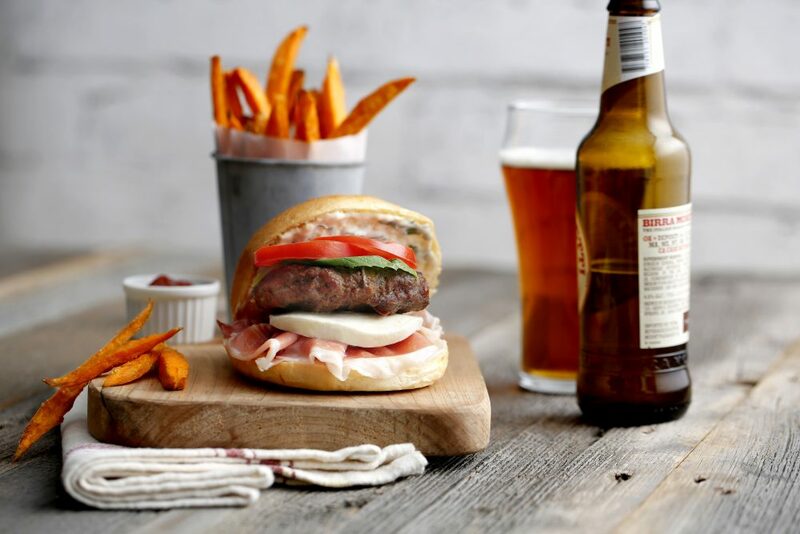 For a perfect pairing, serve this delicious burger with a cold beer and sweet potato fries. Chop 4 slices of prosciutto. Heat a large non-stick skillet over medium-high heat and cook chopped prosciutto until crispy. Combine ground beef, sundried tomatoes, garlic and crispy prosciutto. Shape into four burgers. Grill, broil or sauté until burgers are desired doneness. Meanwhile, combine mayonnaise, chopped basil, lemon juice and lemon zest. Slice rolls in half and spread cut sides with aioli. Top with remaining prosciutto, mozzarella, burger, basil and tomato.